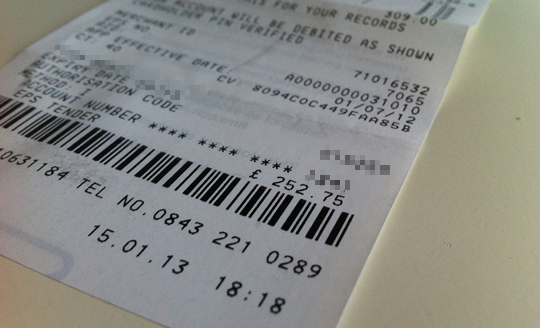 I’ve decided to save HMV, one £252.75 purchase at a time. My heart sank on Tuesday afternoon when the news came through that the HMV Group had entered administration. 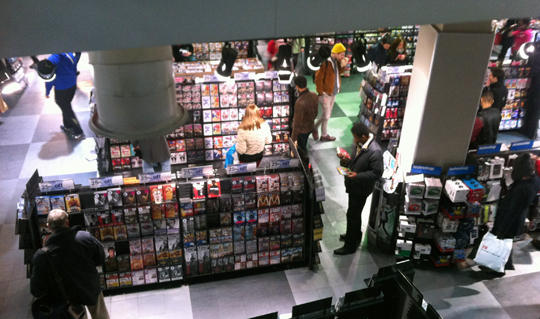 Not because I’d actually spent any money there in the last five years or used any of their stores as anything but Amazon showrooms, but because — like most people aged 8-80 in the United Kingdom — HMV was a massive, brilliant, indispensable cornerstone in the development of my pop cultural taste. I used to get the 137 bus route up to Central London every other weekend during my early teens, and spend hours wandering around the flagship store at 363 Oxford Street (now a branch of Foot Locker) surveying the 3 for £20 VHS cassettes, marvelling at the bold new world of DVD and occasionally ‘walking through’ the adult section. The feeling of sitting on the top deck of the bus home, cradling my shrink-wrapped purchases like newborn children, will forever be seared into the most nostalgic quadrant of my mind. And so, as I’m currently in the process of sourcing 300 teen movies for my documentary Beyond Clueless, I thought I’d rock up to the doomed physical media Mecca on the day that the announcement was made and do my bit to send the 92-year-old institution off in style. 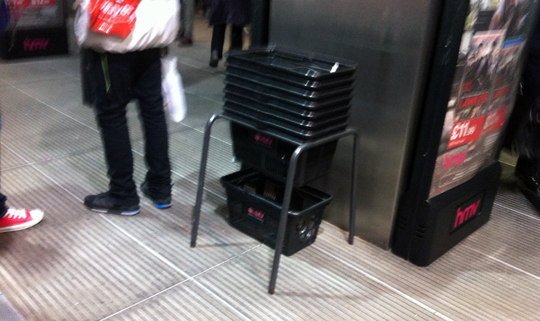 At the age of 11, my definition of a grown-up was somebody who felt the need to use a basket in HMV. Back then, the hoards of mildly depressed-looking middle-aged men who so casually stocked up on £24.99 new release DVDs and £14.99 Friends VHS tapes seemed like emblems of some impossible dream — the freedom to buy whatever pop cultural delights you wanted without a thought for the cost. I promised myself that one day I too would make use of one of the store’s meagre selection of baskets. On Tuesday, that dream came true. Inside, the shop floor seemed busier than usual, a resurgence in interest perhaps prompted by nostalgia or a fear that purchases of The Danny Boyle Collection (£15 DVD, £20 Blu-ray) might soon become inoperable. I made my way upstairs and was disappointed to find that — far from being the de facto big cheese of the DVD department — I was merely one of countless basket-holding shoppers, each looking immensely proud to be doing their bit for the failing monolith. 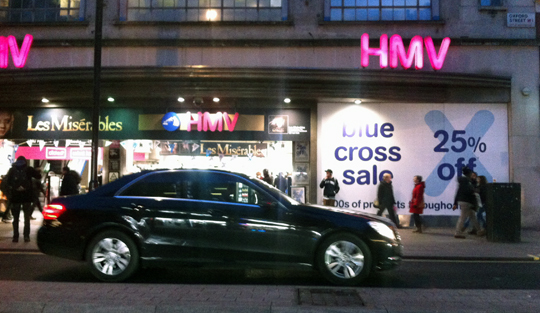 By coincidence, HMV was several weeks into its ‘Blue Cross Sale’ when its death bell tolled. It had been a decent enough promotion, offering 25% off the sticker price of thousands of items, but in the light of new developments, the crosses that adorned so much of the shop’s stock had started to resemble plague notices — grim foretellers of the place’s imminent dereliction. 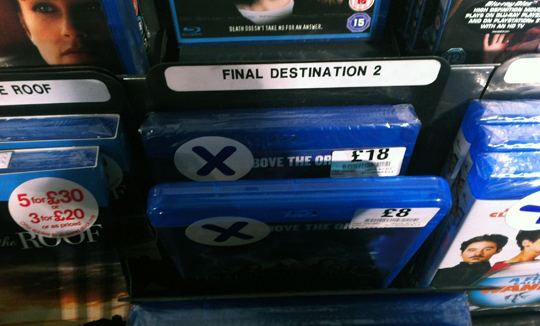 Still, it wasn’t too hard to see where their business model might have gone wrong — a moment’s carelessness could set you back an additional £10 for a mispriced copy of Final Destination 2. 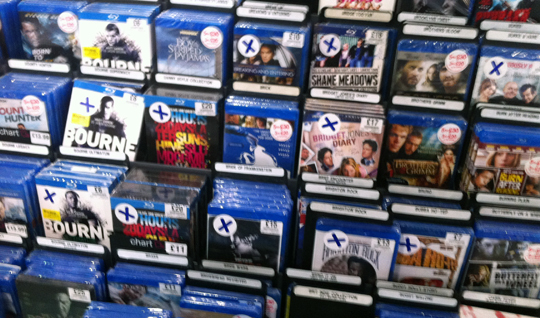 And while deals like the 5 for £30 Blu-ray offer presented pretty good value for money, the sheer quantity of RRPs on display in the store’s more niche departments made clear the drawbacks of physical DVD retailing. Finally, my basket laden with teen movies, I approached the tills, where an impressive twenty-strong queue had already formed. The cashiers were in a wistful mood, chatting with customers about the store’s illustrious history and inevitable demise. Nobody was trying to use vouchers, so thankfully the nostalgic atmosphere wasn’t marred by the breakout of any physical confrontations. Handing my basket over to the woman behind the counter, I assumed she’d clock me for the home entertainment big spender that I so clearly was and welcome me into some kind of executive suite, but alas she appeared to have seen it all before. I left the store £252.75 poorer and 46 essentially worthless plastic discs richer.